Arthur Burns Fink was the first child born to Lucas Monroe Fink and Rebecca Elizabeth Williams. Arthur was born 21 Mar 1915 in Rowan County, NC. The 1920 Rowan County Census indicates that Arthur was living in the Scotch Irish Township with his father and mother. Arthur's age was listed as 4 years old. Some records indicate that Arthur has one sibling, an (Unknown) Fink, born 28 Deb 1917, but that child is not listed on the 1920 Census. If there was indeed another child, he/she must have died before 1920. By 1930, Arthur's father, Lucas had died (in his early 50s) leaving Elizabeth "Lizzie" to run the family farm. Arthur's age was listed as 15 on the 1930 Rowan County Census. Elizabeth's brother, Jasper C. Williams, and his wife, Nattie M., as well as a cousin, Viola Williams, were also living with Elizabeth and Arthur. Arthur married Wilma Eugenia Sain. She was born 09 May 1915 and died 07 Aug 1988. 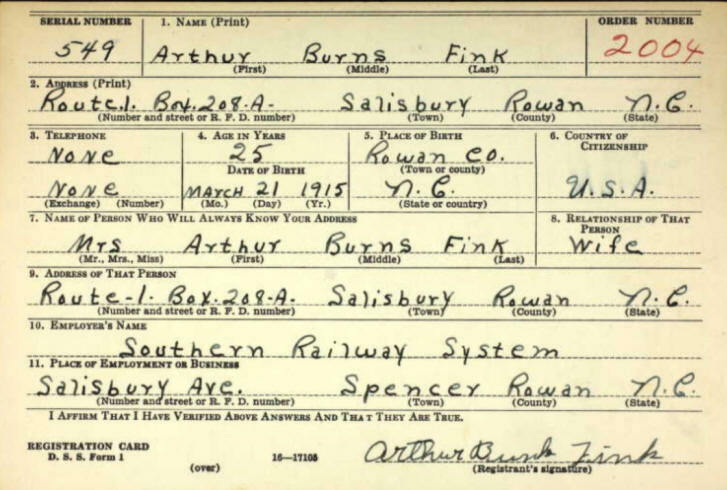 Arthur's World War II Draft Registration Card shows that he is married and living at Route !, Box 208A, Salisbury, Rowan County, NC. 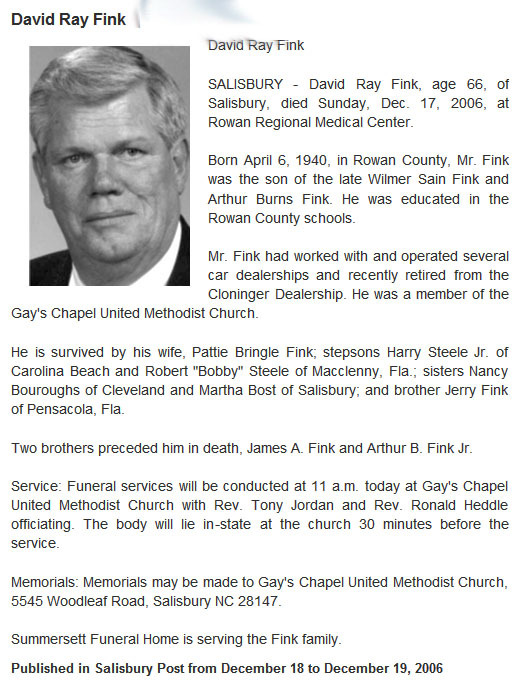 He was working for Southern Railway System in the Spencer, NC. His registration card shows his age (25), his birth date (March 21, 1915) and his signature. Arthur died at the very young age of 40, on 08 Aug 1955 in Forsyth County, NC. 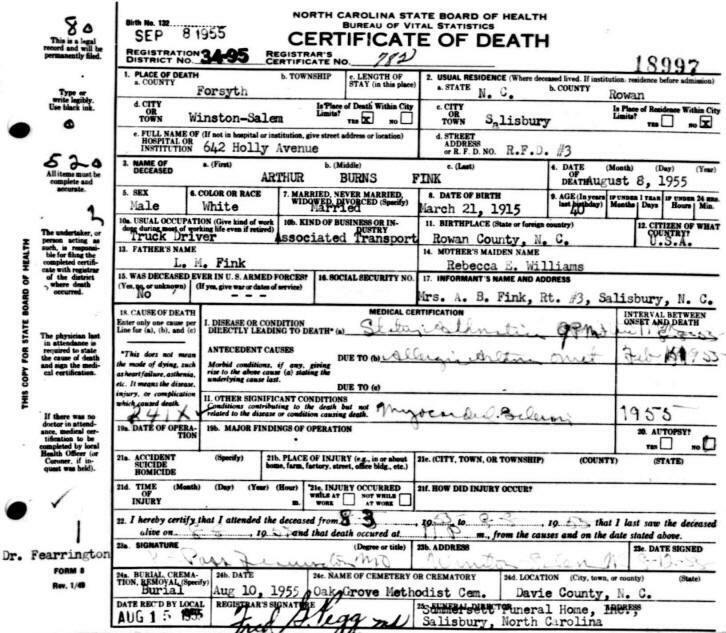 He was living in Salisbury, NC, at the time of his death and was working at Associated Transport as a truck driver. The cause of death was asthma related. 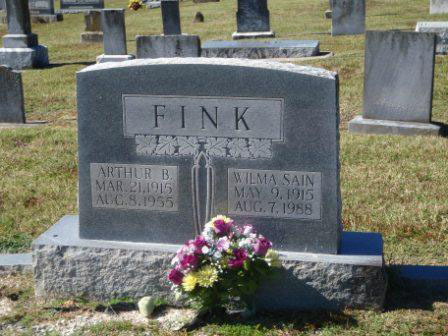 Arthur and Wilma were buried at Oak Grove United Methodist Church Cemetery in Davie Co., Mocksville, NC. 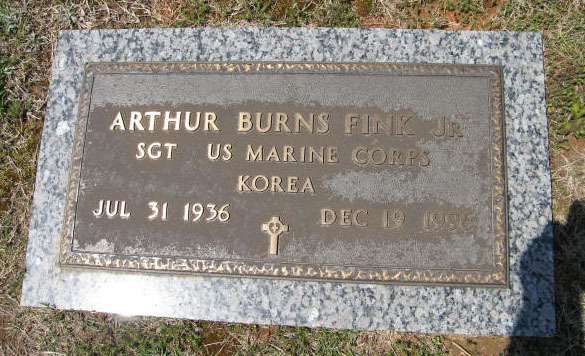 Headstone for Arthur Burns Fink, Jr.